I no longer have these kits available, however fully built up units may still be available from Kevin at the Finningley club. Kits have continued to be made available following the Finningley build weekend - about 70 have been supplied to date (2nd Oct '12), and in return, a number of comments made via the UK Nanowave reflector. These have all been interesting, and are worth mentioning here. The ground leg should simply be re-soldered to the edge of the pad as shown. To test tx LED/rx opto-detector symmetry, fit the transceiver to a its intended optics and focus on a test LED or streetlight about 50m distant. Switch onto tx and rotate the transceiver housing through 180 degrees. Check that the test LED/streetlight is being illuminated well within the transmit beam. Read-just, if necessary. There have been comments that the pillar height is too short, though the units I have built seem OK. One thing to to check is that the pillar is on the correct side of the pcb (ie, same side as the 7808 leaded regulator IC). 'Isn't the LM7301 op-amp following the discrete FET input amplifier too noisy a device to use here?' No, it's OK. You can fit the very quiet OPA209 if you like, but you will not notice or measure a noise reduction in doing so. However, it does have a higher open loop gain, so by all means fit it if you have one! 'Should my receiver be microphonic?' Only very slightly so - you should only notice it when you tap the aluminium housing. None of the components used exhibit any meaningful amount of microphony, however, any movement of the FET gate to opto-detector connection will cause microphony due to change of capacitance of this lead to ground as it moves. If you have problems, then ensure the leads from the FET are as short as they are in the pictures on this web page. Also, if the FET is not fully seated on the pcb, either re-work or apply a drop of super-glue between the FET and the pcb, to fill the void. 'There is only half a volt across the FET. Is that right?' I have had reports of an improvement of sensitivity being obtained by reducing the drain resistor from 2k2 to 470 ohms and adjusting the source pot for best sensitivity (and higher drain-source volts), but I have not been able to duplicate this on the ten or so units that I have tried it on. Some kits were supplied with a 2N5457 FET and some a 2N5459, and I have adjusted the drain load on both without success in terms of improved sensitivity. Reducing the value of the drain resistance value will however increase the overall gain of the receiver, since the op-amp that follows it has to provide a greater output voltage swing to keep the FET drain at zero AC volts. If you are intending to run sub-carrier operation, remember that the open loop gain of the op-amp falls off dramatically by the time you reach 10 kHz, so increasing the op-amp stage gain is not a good idea. 'The aluminium tube is too slack/tight a fit in the mating plastic tube' I think that this is probably a matter of personal preference!. The fit was a little on the slack side on the 4" telescopes available for builders at the RT and that's why a jubilee clip (Ebay 'Wingspade jubilee clip' for examples) was provided for those. As a general comment, the mating tube is sold as 40mm pipe. This is the outside diameter - the inside diameter varies depending on the manufacturer, so if a replacement is being sought, try several DIY suppliers until you find the one that suits you best. 'The transmitter seems to be un-stable' On one unit here using a Texas Instruments brand of LM833, there was instability on transmit with IC5 oscillating at about 1.5 MHz, resulting in the Tx LED being lit even when on receive. The cure was to add a 10pF capacitor across R24. Run the LED at the same current as the original LED - the modulator is not capable of supplying more current and does not have adequate heat-sinking either to allow this. The Finningley Round Table is being held over the weekend 14/15th July, and there will again be an smd soldering workshop available on the Saturday. For those just wanting to dabble, scrap boards will be provided to practice on, and there will be general advice on smd component replacement, both in terms of industry standard practice and short-cuts that may suffice within the average workshop. This transceiver is a little larger than the Finningley 80m SDR receiver of a couple of years ago, but as the photo shows, is of similar complexity. Continuous support for the build and test of this assembly will be available over the entire weekend. Optical QSO’s across the club premises afterwards will probably be considered mandatory. To keep the project relatively simple, the circuitry has been spread over two pcb assemblies, with the main board containing independant receiver and transmitter paths terminating in a 15 way D connector. Although this can be used ‘as-if’, a second interface/test board assembly is included with this providing muting of the transmit audio on receive (and the receive audio on transmit), and a switch to key the main board’s 1 kHz tx tone generator. Plus, two 3.5mm jacks allow baseband operation via a standard PC/Skype headset. Other configurations can be achieved either by wiring directly to a mating D connector, or by producing a dedicated interface pcb, as appropriate. An obvious example of this would be an interface board to allow sub-carrier operation. Whilst the transmit power is modest (0.5W dc input to the LED), the receiver has good sensitivity. Thus, even if the builder has no interest in transmitting, it will be possible to monitor a wide variety of optical noise, including star light scintillation when used with a 4” diameter telescope, and for builders of the transceiver on-the-day, a suitable 4” telescope will be available ‘at cost’ (ie, very cheap). b ) Full transceiver, part smd built. The full transceiver option will be kitted as separate rx and tx builds - thus, if anyone runs out of time over the weekend, they should still manage to complete and take home a complete built, tested and measured receiver (thanks to Barry G8AGN for bringing his test rx test measuring set-up to the Round Table). It may be that some participants will only wish to build a receiver, either because they don't envisage ever transmitting or because the transmitter is considered a little bit QRP - this will certainly be a lower cost option. The pcb has been laid-out to fit the opto-diode centrally within the aluminium mounting and screening tube in this case (see next section to explain the relevance of this comment). The original intention was to use the transmit LED as the receive opto-detector, as popularized in the UK by Stuart G8CYW. This is such an elegant approach, resulting in an easy equipment to set up and use. However, I just couldn't get anywhere near the sort of sensitivity that a standard low cost opto-diode front-end was producing. Running out of time, it was reluctantly decided to abandon this approach and use separate receive and transmit devices. Available for purchase over the Round Table weekend will be a number of 4 inch diameter telescopes. More gain could be obtained by using A4 size Fresnel lenses, but in either case the mounting arrangement is the same. The electronics are mounted within a 1.5 inch aluminium tube - the type used for domestic TV masts. becomes the new focal point of the other. This is a little inconvenient, but it does work reliably enough. So when going from receive to transmit, the housing must be rotated by 180 degrees and vice-verca. To simplify Tx/Rx switching, a board fitted tilt switch is used to sense the Tx and Rx positions and switch circuitry accordingly. No attempt is made to provide tx/rx audio muting when on rx/tx or tx keying, nor is is switching of the 1 kHz tx tone provided by this board. Instead, all the various inputs and outputs together with switching lines and supply input are taken to the 15 way D connector. The user can either plug in the test/interface pcb that is supplied as part of the kit, or he/she can provide their own interface connection (which may be no more than wiring directly to the mating connector). The receiver is a derivation of Clint KA7OEI's design. A reverse biased photo-diode terminates at the gate of a junction FET common source amplifier. To avoid Miller feedback drastically reducing the gate input impedance (which needs to be many tens of M.ohms at the operating frequency if loss of sensitivity is to be avoided) the drain should have zero signal voltage present on it - ie, it should act as a current source feeding a zero ohm load. The departure here from Clint's discrete low impedance load is the use of a trans-impedance configured op-amp. In this arrangement, the negative op-amp input pin is connected (AC wise) directly to the FET drain. There is also a feedback resistor connected to this node from the op-amp output. By terminating the positive op-amp input with a decoupled reference voltage, the op-amp output (by virtue of it's theoretically infinite voltage gain) forces an equal but opposite sign signal to appear at the negative input, keeping it at zero AC amplitude. The op-amp output also feeds the following stage, which is an SL6270 - an old Plessey design agc controlled mic amplifier with a 50dB full gain specification. In order to be able to drive a standard PC/Skype headset, the output of the SL6270 is fed via a BCX56 emitter follower stage. Amplifier gain is made to roll off above 3 kHz, so for sub-carrier modulation users, an output is also made available from the trans-impedance op-amp, which has a flatter frequency/gain characteristic (10 dB down at 25 kHz relative to 1 kHz compared to 30 dB down when using the main output). When using the unprocessed rx AF output to feed a 50 ohm load, a 470 ohm series resistor should be fitted in-line. There is nothing special about the transmitter circuit. Another SL6270 agc controlled amplifier is used to bring up the mic input level to a reasonably constant 100 mV rms. A pre-settable gain controlled op-amp stage increases this to the required level for the current source output stage which drives the Tx LED - a 10mm red power LED of Chinese origin (ebay offering of unknown type number or manufacturer). A pair of SOT-223 output FETs has been adopted in an attempt to spread the heat generated across a large area of pcb track, given that for simplicity, no extra extra heat-sinking is being used. The dissipation in the two FETs is further reduced by dropping as much voltage as possible across their source resistors. Multiple paralleled resistors are used to again spread the heat across a large are of pcb. The transmitter -3 dB frequency roll-off points are 80 Hz and 60 kHz. LED biasing is presettable - either class A or B is therefor possible. Class A should always be used for base-band operation, but class B can be used on sub-carrier schemes to reduce battery drain. A 1 kHz phase shift oscillator is included to provide a tx test tone. The output is taken from the op-amp -ve input, in order to gain the filtering effect of the three RC feedback sections. An emitter follower buffer is required due the low input impedance of the SL6270. a) Provides Tx/Rx switching - linkable as either via the on-board push switch or automatically via the tilt switch on the main transceiver pcb. b) Mutes the rx audio when on transmit. c) Mutes the tx audio when on receive. d) Switches on or off the tx 1 kHz test tone via the second on-board push switch. On receive, the mic input is AC decoupled, to avoid modulation causing unwanted interaction. 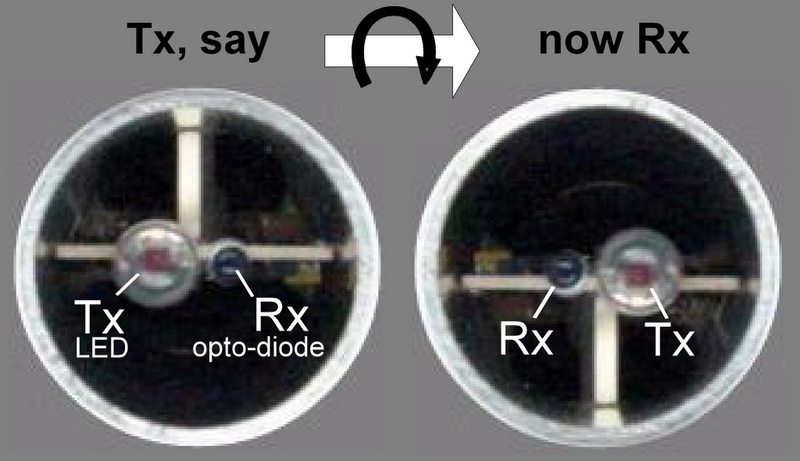 The presence of DC on the mic pin (to power a standard electret insert) must be taken into account, if the agc circuitry on both rx and tx is not going to pushed hard into attenuation by the switch-over transient. On this pcb, this is achieved by having a decoupling capacitor (C50) that remains at the mic bias voltage whether on transmit or receive. 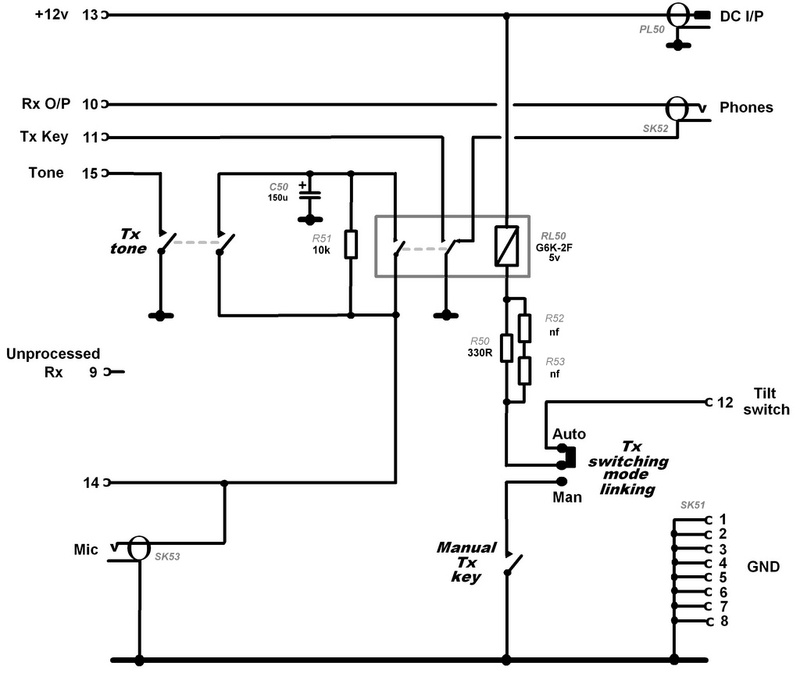 This is connected to the mic input via a series biasing resistor (R51). This is short-circuited to achieve mic muting. On transmit, receive muting is achieved by lifting the ground return on the ear-piece socket. Series resistor combinations to the relay coil enable various relay voltages to be used (we have lots of surplus 5v relays!). 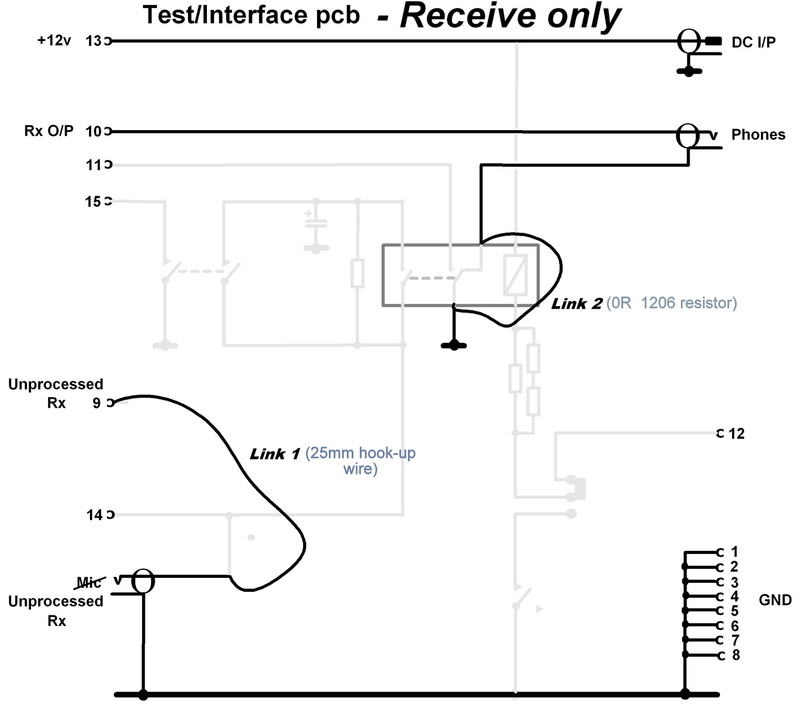 For receive-only final use, a part version of the test/interface board is suggested, as below. A link wire reconfigures the mic socket to use it as an inter-connect to the unprocessed rx output, available at pin 9 of the D connector. These were made available during the Finningley Microwave Round Table so that kit builders at least had a complete working set-up to take home. I find that this size of optics is about the maximum that I can hand-hold and keep just about on-target. This is useful for beacon monitoring. There are a number of shops selling cheap magnifying glasses at the moment for £1. In the Cambridge area, this means 'Thing-me-bobs' and 'Warehouse Superstore', but places like 'Poundland' have been known to stock them. The focal length of these lens's is about 300mm. If the plastic handle is sawn-off and files down to the same diameter as the remaining frame, the result conveniently ends up being a nice tight fit into 110mm plastic file pipe. The 110/40mm transition discs are cut from an easy to work plastic called 'Foamalux', A 10mm thick sheet of this is ideal. It is much easier to work that solid PVC, and in this application is rigid enough. Cyanoacrylate (superglue) is ideal for bonding the smaller 40mm plastic tube to the disc.